Thanks to iPads, iPhones, and ever-lighter MacBooks, we’re doing more work and play while on the go than ever before. A caveat of working this way, however, is that most public Wi-Fi networks (hotspots) are anything but secure, which means they’re prime targets for would-be hackers, identity thieves, and general do-no-gooders. If you’re lucky, your company provides you with a virtual private network (VPN) for securing your Internet activities. But if you’re like the rest of us, you need to fend for yourself if you want to hide your login credentials, email, and other sensitive activity from prying eyes. That’s where Cloak comes in. Put simply, Cloak is a VPN that just works. It encrypts all your Internet traffic so other users on the same network can’t snoop over your shoulder, so to speak. But Cloak does away with the typical VPN song and dance of digging into System Preferences and filling in a bunch of cryptic server details and protocols—not to mention having to shop for and set up your own VPN service in the first place. With Cloak, you simply sign up for an account at GetCloak.com and install a little menu-bar utility. Once you’ve done that, the next time Cloak notices you join an unsecured network—currently defined as any network that doesn’t require a password, though the company is working to broaden this rule and your control over it—the utility will leap into action and activate your VPN. 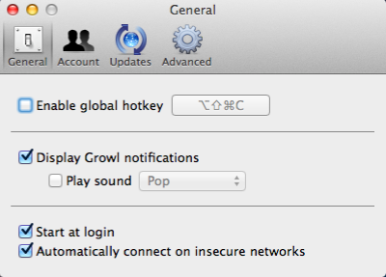 Once Cloak’s icon glows solid blue in your menubar—and, optionally, displays a Growl alert—you know you’re connected to Cloak’s network of secured servers that encrypt everything you do on the Internet. You can instead opt to manually connect and disconnect using Cloak’s systemwide menu, but in my testing, the auto-connect feature works well all on its own. The Cloak utility is free, as is the company’s universal app for iPhone and iPad. The Cloak service—which provides the actual VPN—is free for up to 1GB of data or two hours of usage (whichever comes first) per month. The company also offers unlimited-time plans for 20GB ($8) and 50GB ($15) of data per month.